Dustin Baylor knew from the time he was in elementary school that he wanted to be a doctor. All his life, he also wanted to be a dad. What he wasn’t able to appreciate until adulthood was how challenging it might be to be awakened by his pager going off with a medical emergency just as often as by one of his three children having a bad dream, needing to go to the bathroom or just falling out of bed. Baylor was one of dozens of dads who wrote to TODAY.com about doing it all: Excelling at work, raising kids, taking care of household chores and finding some time to spend with their spouse or partner. Almost every dad we heard from said they wouldn’t want it any other way, although many conceded they sometimes struggle to make it through the day -- and night. “I often feel overwhelmed trying to do it all," Baylor wrote. "I love my wife, my job and my family. But whereas men in past generations emphasized being a provider first and foremost, I think modern fathers take on many more roles." The juggle between work and home life has long been a hot topic for women, many of whom have known from early on that they would work and raise children – and may even have watched their own moms do the same thing. But many young dads are choosing to take a role in their home life that is more active than seen in any generation before, said Brad Harrington, executive director of the Boston College Center for Work and Family. That means they can be both less prepared for, and less adept at, juggling both roles. “I think they are working really without a script,” Harrington said. What’s clear is that more dads want to figure it out. Harrington and other researchers have noticed a clear and pervasive shift toward more dads choosing to do everything from change diapers to chaperone field trips. “The expectation on the part of most fathers is they’re going to be much more engaged than their father was,” Harrington said. And as more women work, and bring in a bigger chunk of the family’s earnings, Harrington notes that men also are finding that their spouses expect them to pitch in more on chores including laundry, dishes and grocery shopping. “The expectation is, ‘I can’t do it all and you’re going to have to share,’” Harrington said. Yet employers have not necessarily caught up with the evolving roles men are playing at home, leaving many feeling caught in the middle. A landmark study by the Families and Work Institute, released in 2009, found that dads actually feel more conflict between home and work life than moms do. Ellen Galinsky, president of the Families and Work Institute, said the research showed that even as home lives become more egalitarian, men continue to feel pressure to fill the traditional provider role by putting in long, hard hours at work. Galinsky says the weak economy and high jobless rate likely have exacerbated the financial pressures. “We expect that it will either maintain or increase the conflict that men experience,” she said. Baylor, 34, and his wife, a physical therapist pursuing her doctorate, have three kids ages 6, 4 and 1. On a typical day, that means the couple has to get kids to daycare, a pre-K program and kindergarten before heading out for their own work days. In the afternoon, Baylor’s wife picks up their oldest son from school and drops him off at Baylor’s medical practice, then goes back to finish up her workday. That means Baylor and his nurse, who also has a child to watch in the afternoons, have their children in the office as they finish up their work day. Baylor admits it can be a challenge when the kids want to run down the halls while he has patients to attend to. But he describes fondly the way his son stands on the back of his chair, chatting about the school day, while he does office work. He recently brought more toys into his home office so his kids can be nearby when he’s on call or dealing with paperwork. “I’m actually used to working with kids orbiting,” he said. 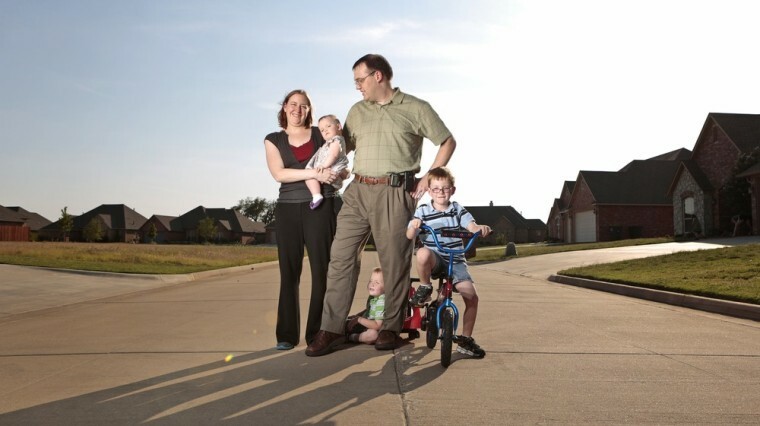 The desire to be an active parent is one of the reasons Baylor opted to have a family practice in Enid, Okla., rather than join a hospital staff. The decision has meant less money but more flexibility to have a child at work or take off on a family vacation. That’s one of many ways in which Baylor is different from his own dad, who worked as a mail carrier while his mom mostly stayed home while he was younger. But it still can be hard to juggle. Baylor and his wife decided to have kids while he was a chief medical resident, and he says he wishes he had been able to help his wife out more in those early days. Another struggle came when his middle son started having seizures because of a rare health problem. He is doing fine now. “I wish I could say that I have no regrets at all, but that really wouldn’t be true. I wish I could have taken more time to just be a dad when my first son was born. I wish I could have been around constantly to shelter my second son when all those seizures were happening instead of meeting him in the emergency room. I already wish I had even more time with my daughter individually, which is not a unique problem for the youngest child of any family,” he wrote in his response to TODAY.com. Like a lot of dads, Baylor rarely gets time for date nights or other quality time alone with his wife. While many face the same struggle, few have to go to the lengths John Martin does to be both a father and a spouse. Martin, 45, received an e-mail from his high school sweetheart, whom he hadn’t heard from in 27 years, soon after his marriage ended. When they finally met up nearly a year later, a whirlwind weekend together was all it took for them to realize they still had the feelings they’d had at age 16, and within a month they were engaged. But there was one big problem: Martin and his kids live in Denver, while his new wife and her kids live in the Seattle area. To maintain his relationship with his kids and build a relationship with his new wife and teenage stepchildren, either Martin or his new wife fly back and forth to be with their spouse nearly every week. They’ve maintained that routine for close to two years, and Martin has cut his employment to 80 percent of full-time to balance it all. “The way it worked was to leave the kids alone and to kind of rotate around them,” he said. Martin savors watching his girls play softball and going out for family pizza night and says that while he loves his job as a lawyer, his wife and kids come first. Still, the challenge of maintaining two households and commuting across several states can be disorienting, and tiring. Anthony Noriega, 33, also sometimes finds himself struggling to keep up with the hectic schedule of raising four kids with his wife, who takes care of the kids and goes to school. Like many parents, Noriega describes a life that can be a dizzying whirlwind of cooking, paying bills and getting everyone to bed after a long day at work as a web marketing specialist in Boise, Idaho. He admits it doesn’t always go perfectly smoothly. But Noriega said his own parents struggled with addiction, and he knew from the time he was a teenager that he wanted to get married and raise his own family in a very different way. He may pine for a quiet moment, but he has no regrets about how things have turned out. “My priorities are providing a stable foundation for my kids growing up (and) not having to worry about whether or not they’re going to have school clothes, food on the table - the things that I had to deal with as a kid,” he said in an interview. Some dads wrote to TODAY.com to remind us that not all of them have that struggle. Scott Bouma, 35, and his wife have four kids and his wife stays home full-time. The fact that his wife is a stay-at-home mom means that Bouma, a software engineer who lives in Helena, Mont., feels he can spend time with his family at night or on the weekends instead of dealing with a list of chores and errands he imagines dads with working spouses face.